The case for open access fiber broadband infrastructure throughout the U.S.
What if the United States operated roads the way we currently operate the internet connection into our homes, schools, and businesses? Let’s imagine this for a moment. You love your house. You genuinely like most of your neighbors. You’re happy in your neighborhood. There is just one catch: your neighborhood roads are owned and operated by Ford Motor Company. They built your roads in 1972, and as your only choice of road provider they haven’t upgraded them in a while. Moreover, your roads permit exactly one car model: the glorious 1972 Pinto. That was fine when you moved in. All of your neighbors also drive 1972 Pintos. Some of them foolishly settled for the basic sepia sedan. Others opted for the lime green hatchback, like you. “A bit more per month, but worth it,” you told yourself. In the neighborhood next to yours, there are two roads in front of every house. Because of that, residents can choose between a 1972 Ford Pinto or a 1985 Chevy Nova. “Must be nice,” you mutter. On the east side of town, some neighborhoods have no road at all. “Must be rough,” you sneer. In the beginning, you never noticed your Pinto’s limitations. But as the years go on, you begin to feel more and more that people from outside your neighborhood seem to be racing ahead of you. Literally… you go 0–60mph in 11.3 seconds. The salesperson assured you this beast would top out at 100mph, but you’ve done many speed tests over the years: no way this thing does more than 60, 65 tops, and that’s with no one else in it, with the radio off. And you swear every year it seems to be getting a little slower. Yet despite its limitations, your tri-door blast from the past remains perfectly decent at some things. A quick trip to the store? That hatchback upgrade is still a miracle of engineering. Other types of trips… not so much. Your teen secretly hates you every time she drives your jalopy to the local Fortnight party: she’s always late and the other players make fun of her! During frequent family trips, your family of 5, all packed in, completely overwhelms your lime-green lemon’s whopping 86 horsepower. Worse, there are a growing number of places your Pinto simply can’t go, even if you want (or need) to visit those places. Those new offices with jobs, those next-generation amenities already built in other parts of the country? Off limits to your family. You stick to Pinto-friendly backroads. Ford owns your neighborhood’s roads, so what are you going to do about it anyway? And just to ensure your neighborhood never takes its future into its own hands, Ford worked with your state’s lawmakers to outlaw spending public money to upgrade your neighborhood’s 1972 Pinto-only dirt roads. They convinced your town council that things here are just fine. “If it ain’t broke, don’t fix it,” they said. Besides, what business does a town have meddling in the affairs of road service providers? Meanwhile, in a town far, far away, a different kind of neighborhood road lets people choose any form of transport they want. Whatever suits their need, their budget, their taste: Teslas. Bird scooters. Boosted boards. That fantastically heinous-looking Wheel thing. And choices even more exotic… Is that the new 5G hovercar?! Some residents even have one of each. Your neighborhood makes you drive a 1972 Pinto. 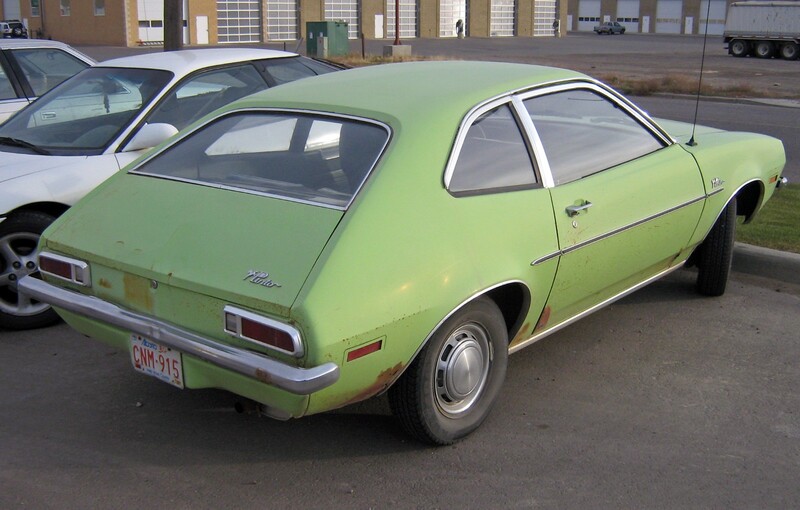 You chose your neighborhood… so you chose your 1972 Pinto. Your family depends on your lime-green machine. When it works, it gets around okay. It gets you from your house to your job. To your kid’s school. To the hospital. You shake off the nagging sense that your life is, in subtle yet increasingly consequential ways, trapped in an especially regrettable hatchback from 1972. Your family packs into the Pinto. Sunday road trip. Let’s putter somewhere new. “Take Me Home, Country Roads” cuts in and out over AM radio. You wish they still made 8 tracks. Feeling the chorus, you upshift to fourth and final gear. The dashboard rattles as the speedometer nearly breaks at 60. Your teen rolls down her window, watching as the world passes by. ↑ Thankfully, this analogy is absurd. America was imagined and built to run on freedom of choice. With rare exception, we built our nation’s pathways through public investment, to offer rich choice among transportation modes, makes, and models. So why is our internet infrastructure and access operated in this dystopian setup? As we did for our roads, we the public invested in much of the internet’s equivalents of highways and major streets. Where these providers chose to build, they did so on their own terms: primarily dirt road equivalents, with an approach that only supports the equivalent of owning one model of car at a time. The FCC estimates that 19 million Americans still lack access to fixed broadband at threshold speeds, and 60% of subscribers have a single choice of provider. They decide how much we pay, how long we wait on hold to resolve problems, and whether our businesses can be competitive. To protect their interests, they also prevent us from switching to other “road” providers. Doing so incurs a fine, and confronting the dystopian reality that we’ll need to wait at home starting from Tuesday at 10am and sometime next leap year for someone to come change out the driveway equivalent. In order to ensure the continued economic output and wellbeing of our nation’s communities — in order to connect to our future — we must make open access fiber-optic infrastructure the defining infrastructure investment of our time. Fiber-optic infrastructure is our century’s equivalent of the roads, electric grids, and water systems that defined our nation’s leaps forward. Every individual and connected device in the U.S. should be able to access the internet — the global brain — on neutral terms, with true equality of connection. We have a cruel and widening homework gap, a growing workforce skills gap, and a society that’s becoming more unequal and less in touch with the rest of the world each day. The ability to participate in an increasingly digital economy, and to better direct precious resources, hinges on ensuring access for all. Our success as a 21st century nation depends on harnessing everyone’s potential — not leaving millions unable to participate. To ensure our nation remains competitive with the rest of the world, to ensure access to the global brain, to each other, and to the future of many services — ranging from healthcare to entertainment and things we haven’t yet begun to imagine — we must remember: our communities are kinds of macro-organisms we co-create. Just like our individual selves, our communities must first have proper physical central nervous systems (fiber optics) upon which we can build proper remote senses (wireless). We must take our future in our own hands. We must invest in deep fiber-optic infrastructure, and operate it as open access from end to end. This critical change to the status quo will save us money, supercharge our economies, and improve quality of life for everyone. Fiber infrastructure is the essential replacement to copper wire or coaxial cable, and is the prerequisite to make use of next-era wireless applications. The way we use the internet today — and the way we want to use it in the future — demands future-enabled infrastructure. Carrying information at nearly the speed of light, with many orders of magnitude greater capacity than the next-best technologies, fiber is the only acceptable foundation. As Harvard Professor Susan Crawford illustrates in her must-read new book, Fiber, the difference between copper and the upgrade to fiber is the difference between a “trickling garden hose” and a “15 mile wide river.” What we can accomplish with fiber as a foundation is practically limitless. Consider the awe-inspiring possibilities for advanced telemedicine service, beyond the basics of video calls with care provider. The distributed future of healthcare delivery requires vast amounts of data streaming, both ways, over a connection that cannot be affected by conditions like solar flares and concrete walls. Exciting new wireless applications such as 5G also require fiber network infrastructure. Fiber is paradoxically the critical underpinning to connect to our wireless future. Wireless signals are only wireless until they hit the closest antenna and run on wires for the rest of the trip. Without better wires, all our wireless devices will be too congested. American-style market competition can extend into the household for internet-based services, just as our roads permit a wide variety of vehicle types. Someone with a great idea, or a company with a history of providing great customer service, can compete without needing to build an entire network, or offer a complete bundle of services. The result would be more affordable and better internet connections for customers. Open access networks in every community, operated by neutral actors like the local governments that built our streets, or rural co-ops that brought electricity and telephone service to the farm, will maintain a naturally neutral internet, and are crucial to unlock the full force of fiber-optic connectivity. Companies will succeed on their own merit rather than having the right connection to a cable company or other corporate giant. Even 5G would be just another Ford-owned road if we rely on providers to each build their own networks to connect the small cells. Contrary to what incumbents would have us believe, open access fiber enables our private sector. Revisiting the road analogy, we did not expect UPS and FedEx to build and maintain their own roads. By using shared roads, both deliver better service at lower prices. The open access approach empowers new and existing service providers by removing the expectation that they must invest their own capital into building the infrastructure required to deliver services. In addition, lower barriers to entry encourage new service innovations. When our nation’s places have internet connections on par with the intranet inside the walls of state-of-the-art institutions, new possibilities begin to unlock: smart cities; efficient, precision agriculture; responsive, resilient infrastructure. Especially exciting: the potential to deliver healthcare to patients everywhere. Telehealth already brings previously impossible value to parts of the world where fiber is nearly ubiquitous. Imagine distributed outpatient acute post-op care: a bed equipped with many of the same gadgets as a bed inside a research hospital, with uninterrupted connection to Doctors. How much could we could save in national healthcare — tens of billions of dollars per month? More importantly, how much better is the experience for patients and their families receiving weeks or months of care delivered to their homes? The true open access fiber revolution is already underway and Sweden is leading the way. The same commitment to open innovation helped create great world-changing digital companies: Skype, Spotify, and Klarna, to name a few. We have the power to drive the same transformation here in the U.S.
Our allies in Sweden have worked to light-up the majority of their country with open access fiber, at half the population density of the US, almost entirely through market competition over shared infrastructure. Just like we did with our roads. The quality and variety of services, and the lower prices on open access fiber networks, connect Swedes to their future. Here in the U.S., we’re at a fork in the road. Our current closed copper path protects old-order incumbents, but precludes future growth and possibility. We can’t advance with the rest of the world as it moves to 5G and beyond. In some ways, we’re building new cars without building roads capable of supporting them. The other path is made of open access fiber. It connects our people and our devices to a future with clear and complete access to information, at nearly the speed of light, with virtually limitless capacity for new life-enhancing innovations. It also offers incumbents a much-needed gateway to these new frontiers. Thank you to everyone already in the fight to better connect us all. Thank you to those who’ve helped me begin to understand the magnitude of this largely invisible challenge facing our nation, and better ways to connect. Thank you to those who read and helped shape this piece: Björn Wannman & Isak Finér at COS, Deb Socia of Next Century Cities, Chris Mitchell of ILSR, Eva Arevuo & the all star Neighborly team.